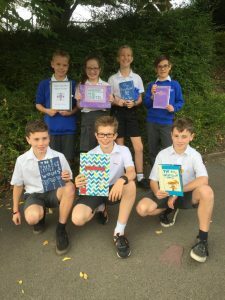 Some of our children took part in the Marlborough Literature Festival Pop Up Book Competition. They were asked to make their own interactive version of a fairy tale, either involving a traditional retelling or a fairy tale with a twist. 370 entries were received from children aged between 5-10 and from those, the judges chose 9 Winners and 20 Highly Commended. We were thrilled to discover that in Year 6 we have 2 winners (Jamie & Ursula) and 5 Highly Commended (Nicholas, Carys, Seb, Archie & Baxter)! All of our entries were truly spectacular – it is very clear that the children took a lot of time and put in a lot of thought into their amazing creations. Very well done to everyone who entered!